Today Charlotte is thirteen months old. She’s been keeping me so busy this week that I haven’t had a chance to note any of her greatness. And she has been great. So, what has Charlotte done this week? It has been a week full of development for Charlotte. Both her Speech and Physical Therapists noted that they saw big changes since last week. Philippe and I have been continuously in awe of how our baby is turning into a toddler, how aware she is of the world she lives in, and how she is beginning to interact with everything and everyone in it. –She’s gone from speaking a few syllables to full-on babbling, complete with intonation. Mostly “ba ba ba ba.” I’m trying to get it on tape for the audioblog, but she clams up the minute I dial. –She’s really taken to walking with the push toy. 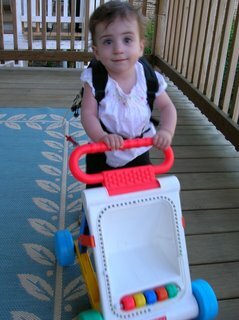 She thinks it is a blast; even with her little pump backpack on. We’ve been practicing on her deck and on the sidewalk. Thanks to my sister and her PT we’ve got a push toy for upstairs and downstairs. –She’s finally gotten the knack of getting from all-fours to sitting on her bum. Funny that she did that after she started cruising, but, no matter, she’s doing it now! She blew her first kiss! –We started Gymboree. She loves it! I never thought I’d do Gymboree—had my heart set on the more modest park district program. But, Gymboree is the only thing that works with her nap schedule. And did I mention that she loves it? She doesn’t like the slides, but she digs the air log that the kids push and thinks the bubbles are the best thing ever. 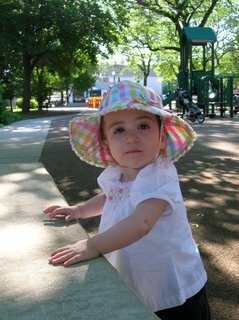 She interacts very nicely with the other children and I’m having fun meeting their moms and dads. –Teeth # 7 & 8 came in earlier this week. We had some sleep interruption that we attribute to teeth, but nothing major. –And–the news you’ve read this far to get to–she’s eating! Well, she’s eating a lot more than she was. On Wednesday she took 4 ounces at each of her three meals. That’s 3.5 ounces more per meal than she had taken in a full day 3 weeks ago. She no longer uses a bottle–that’s strictly for babies! Her sippy cup is only for water according to Charlotte (she drinks several ounces a day.) 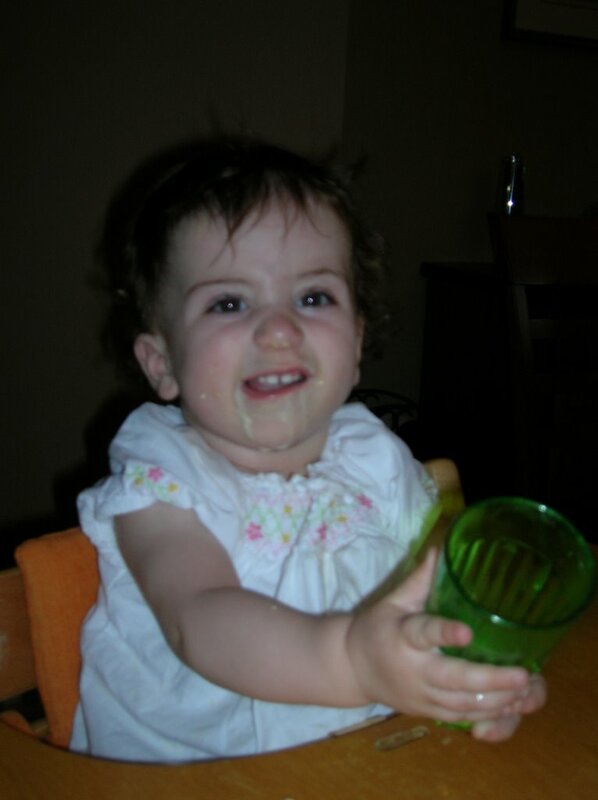 Big girls drink their Pediasure from an open cup. Charlotte has several in pretty colors. She’s still vomiting at least once a day. We clean it up and move on. We’re keeping our fingers crossed that the eating is a trend and that being upright will help abate her reflux. I’ve read that many children outgrow reflux by about 20 months. Perhaps we’re seeing signs of that. Check out my milk mustache! More milk now! 8/18: First dentist appointment! Charlotte will go to a dentist early due to the acidity of reflux and the potential damage it can cause. What’s exciting about this schedule? These are Charlotte’s only doctors’ appointments prior to her 15-month well-baby check up. In the same period last year, she was going to the doctor at least 3 times a week. Hey, I know that shirt! 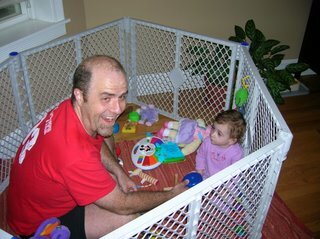 I loved that one — Ellie got it for her first birthday. And my fairy goddaughter looks as adorable in as Ellie did.Hooray for Charlotte’s many milestones!! We’re proud, as always (like I have anything at all to do with it! ).